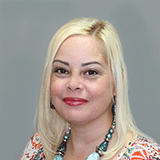 Mrs Hernandez is a Senior Provider Specialist for Primecare, LLC, working in Hernando, Pasco & Citrus Counties. She has a Bachelor's degree in Criminal Justice from Interamerican University of Puerto Rico. Prior to joining PrimeCare, LLC. Mrs. Hernandez was responsible for coordination and processing of all patient specialty services, and assisted in educating patient / family with external resources when needed. She also communicated with the patient for all scheduling requirements, and coordinated pre-admission testing requirements with clinic personnel and patient. She was also responsible for completing all administrative functions associated with referral and all consultant reports and documentation. Mrs. Hernandez recently completed certification for certified medical coder. Mrs. Hernandez has been with PrimeCare for 10+ years.